Nothing upsets a nerd more than being confused for a geek. Nerds are smart while geeks are smart asses. Nerds invent robotic vehicles that explore alien worlds. Geeks explore alien worlds by watching old Star Trek episodes. Nerds write lines of code for computer software and operating systems. Geeks recite lines of dialogue from Battlestar Galatica, Star Wars, and Dr. Who (or maybe Inspector Spacetime). If you are a nerd, and you are tired of people calling you a geek, these socks will end your torment. One Size Fits Most. 75% Cotton, 17% Polyester, 5% Spandex, 3% Rubber. Made in USA. 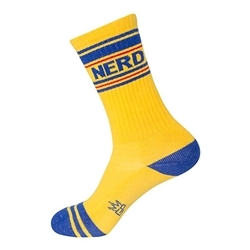 These wide ribbed socks reach to mid-calf on most folks and fit a women’s size 6 US to men’s size 15. As a thicker weave, these socks are optimally worn with sneakers and other roomy shoe styles. Machine wash cold, line dry.